My favorite newbie in TS3 - Trixie! Last week, I had the immense pleasure of seeing Toy Story 3. Let me just say — yes, you have seen the reviews about how “OMG AMAZING GO SEE THIS MOVIE NOW” this movie is. Yes, it seems like they are being a little over the top. No they are not being over the top. This is by far one of the best movies I’ve seen in a long time — I think it’s partially due to the fun action, hilarious dialogue and really tight story. It’s also because we’ve grown up with Woody, Buzz and the gang and that simple fact makes all of the emotional beats of the movie hit that much harder. I’ve seen the movies multiple times over the years (including the really fun double feature they had in theaters last summer) and this really was the perfect way to end the saga of Andy’s toys. To say I cried a ton a little bit (especially the end!) is probably the biggest understatement I’m making in this post. My sister even cried, and she’s normally the one making of me for crying in movies. The movie starts off with an action packed opening, that many others have likened to Indiana Jones and they are completely right. It’s such a fun sequence, and really brings you right into the world. As the previews show, they end up at a daycare center, and prison break-esque action ensues. We meet a ton of new toys (“New toys! !”) and we learn about being true friends, and growing up. I truly cannot recommend this movie more, to anyone of any age. *Trixie! She was one of my favorite new characters. I wish I could type out her “shush” fight with Mr. Pricklepants because it had me rolling in the isles. I actually really liked all of Bonnie’s toys. *Bonnie was the cutest little girl. I love that she has such a vivid animation, and becomes the perfect person to trust with Andy’s toys. Haunted bakery! Even though I cried the entire time Andy was showing her who all of his toys were, and how he liked to play with them, and then that look on Andy’s face when she wanted Woody OMG. Perfect bittersweet ending. *Speaking of other moments I cried – Woody’s face when they recognized that some of the toys weren’t with them anymore. BO! I was also sad when the green army men defected. I may be a giant sap…please don’t hold that against me. *Barbie and Ken were hilarious! I loved Ken — “I”m not a girls toy! I’m not!” and I really liked that Barbie stuck up for her friends, but still got to end up with Ken. *There was a sudden moment in the film where I realized I forgot I’d been watching an animated movie. Ken was talking and I’d literally forgotten I was watching CG animation, they seemed that real up on the screen. Bravo Pixar. *Lotso is a giant jerk, and made me feel really bad for Big Baby (even though that doll was creeeeepy). His backstory was pretty sad though, and sortof reminiscent of Jessie’s story in Toy Story 2. That said I still like my Losto teddy bear that smells like strawberries. I’d like to believe I have the replacement Lotso, who was probably nice. *The Tortoro reference was pretty cool. I’m a big Miyazaki fan, so it was a fun shout out. *Buzz’s spanish dancing. THAT literally had me crying from laughing so hard. He and Jessie are adorable, and he was hilarious. The whole movie was pretty much amazing. 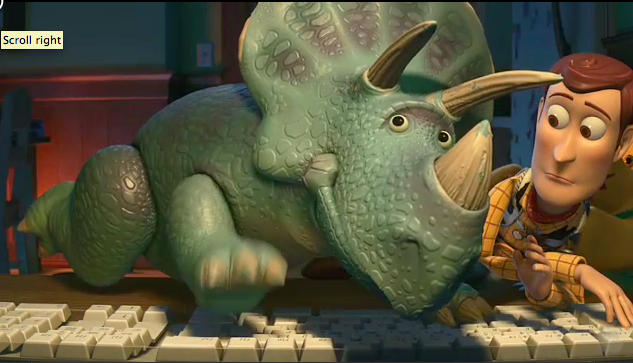 Thanks, Pixar, for helping me stay 5 years old at 23. You rock. You didn’t put it in, so I’m typing it here: One of my favorite parts was during Lotso’s back story when they finally get back to the house and Lotso is like, “She replaced us!! !” and Chuckles says, all quiet, “No Lotso, she just replaced you!” hahahaha so amazing. And I’m sure you have the replaced Lotso, who probably was really nice! lol, you’re so stinkin’ cute! Miss you!